﻿Use the special group code CNS when booking by phone or online. You are never far from the office in our newly remodeled Business Center. Our wireless high speed internet connectivity makes it easy for you to catch up on work, or check your e-mail. 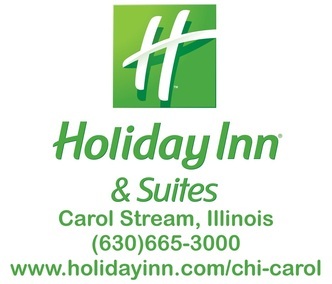 The Business Center also has a fax machine and copy machine for your use when you are staying with us at Holiday Inn Carol Stream. Our helpful and courteous staff can also arrange for any audiovisual equipment needs that you may have during your visit. Remember, our cocktail lounge is open until midnight on the weekdays, and 1:00 am on the weekends. Why not meet for a drink after work? What a great place to relax with your friends! Come on in, the water is great! Take a relaxing dip in our large indoor pool, or just catch up on some reading in our whirlpool. We want you to feel like Holiday Inn is just like home! Things are shaping up great in our fitness room! We offer the finest in exercise equipment which means there are no excuses for missing your workout when you are away. Our exercise room features two treadmills, exercise bike, step machine and universal weight stations which covers all of your fitness needs.